Solius is a small community (more scattered buildings, a small urbanisation and a golf course) near to Sant Cristina d'Aro into the Ardenya hills (confusingly called Cadiretes in Spanish) on the south side of C65 and Vall d'Aro - the hills on the other side of the valley being the Gavarres. 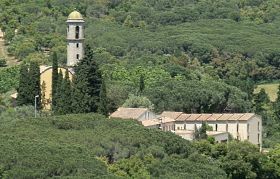 We park next to the monastery of Sant Maria de Solius (Google labels it as Sant Agnes), which according to the information board outside is famous for its Gregorian chants at mass. To reach the monastery the road passes by some well-tended masias and farm fields but the road after the monastery almost immediately climbs into the woods of the Ardenya hills. We're walking in the sun and the first hottish day (26C) of the year. June has just arrived and it feels like someone has just turned the oven up from an unusually cool wet May. 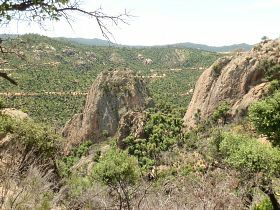 The route out from Sant Maria is slightly peculiar because it starts as a broad two-lane tarmac road then suddenly turns into a rough dirt track as soon as it reaches the trees, and as soon as it reaches the trees the landscape changes immediately.. 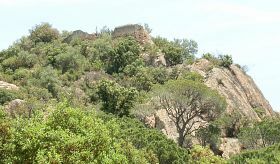 The Ardenya's at this area (and behind Sant Feliu de Guixols) are quite barren with a lot of bare rock and with the heat of the day it feels quite arid and dry even though there was rain in the past two days. We have water, but also need to ensure we have sun-lotion on for walking in the summer. The trees around are relatively sparse, most of the vegetation is low undergrowth and as we climb we get views across Vall d'Aro to the sea at Platja d'Aro. After a few hundred metres we notices that the trees, though green in full foliage, have blackened trunks and burnt stems from a forest fire last year. It's amazing though how quickly the vegetation has recovered. The road continues upward into the hills. 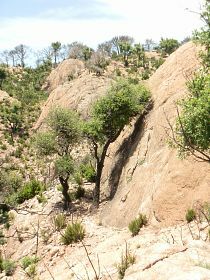 Large isolated bare stones of 20-30m in size stand out from the terrain like huge oversized boulders. At the top of the forest path we meet a tarmac'd road. From a previous exploration we know this just leads to a composting centre. We turn to the right and continue into the hills. A few hundred metres on a few cars are parked in a layby and a handpainted sign points to Puig Ponça. We follow the track into the woods and down slightly and emerge at a clearing above a number of the isolated boulders standing like fingers pointing into the air. 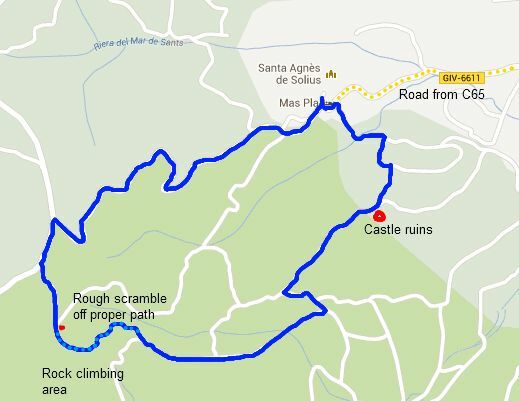 The map marks this as a climbing area and we can hear climbers around us and see a Catalan flag on one of the fingers. The elevations are not sharp and vertical, but they are smooth on the sides. We're not entirely sure of the path or how to get down so we follow a small track downwards. There is dry gravel on the stone surface and it's quite slippery so we end up scrambling and sliding down in various locations. We can see the path we're trying to reach down below us and just hoping the track we're on doesn't lead to a climbing point at an edge. Fortunately we find a way through and reach the road and start with the walk back towards Solius. Ahead of us we can see the ruins of Solius castle on one of the jutting rocks. At the second junction we turn left and walk up to a ridge. At the top we can see the path that passes by the castle - part of the standard castle walk for the area. The terrain changes for the second time, shifting from the rough, arid, barren rock-scape to a gentle path under pine trees with a cool breeze blowing off the sea. Ahead of us another family are taking a picnic underneath one of the rocks and we can see pins and clamps knocking into the stone. It's a lovely picnic area with the pine trees and level - ground. The castle ruins are above us to the left. There really is barely anything left of the castle. Even the steps carved into the rock seem to have worn and fallen away with large tree roots growing over them. It's still possible to climb up though and appreciate the views back over towards the monastery. The last stretch is into the small urbanisation near Solius where the houses are broadly scattered and as we leave the landscape changes again, back to the fields and grasses as we return to the car.